Adding users is easy. Simply click “create user” and then enter their information and permission level. They will automatically receive an email with their account and login information. Do you also want to share data and dashboards with these new users? To share data, select the Datasets tab and find your dataset. Click on the gear icon to view data settings and select the “Share with Users” option on the left side of the screen. Click the “add users” button to get a full list of users that can be added. 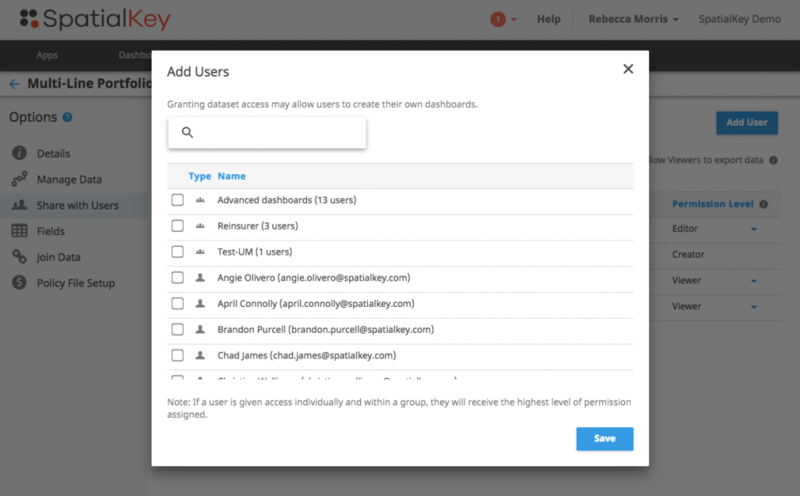 Once the users are added to the dataset, you can manage their permissions levels (See screen above). Sharing dashboards is a simple two-step process. 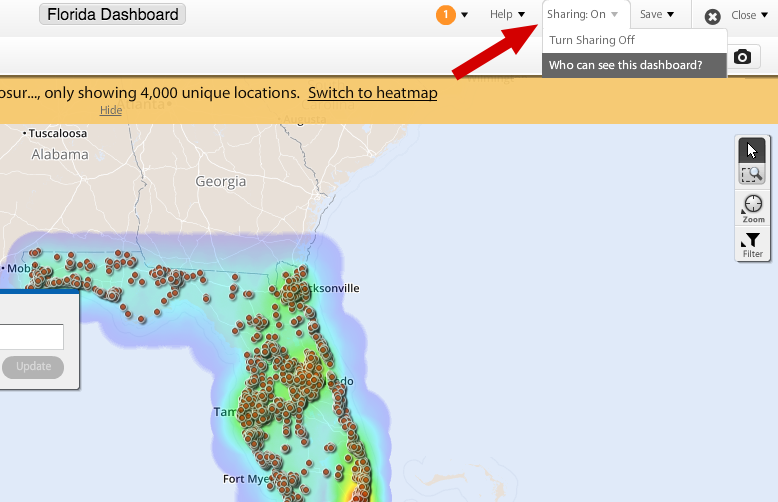 First, a user must have access to ALL datasets included in the dashboard – see the Sharing Data section above for details on how to share a dataset. If a user does not have access to ALL datasets included in the dashboard, they will not be able to view the dashboard. 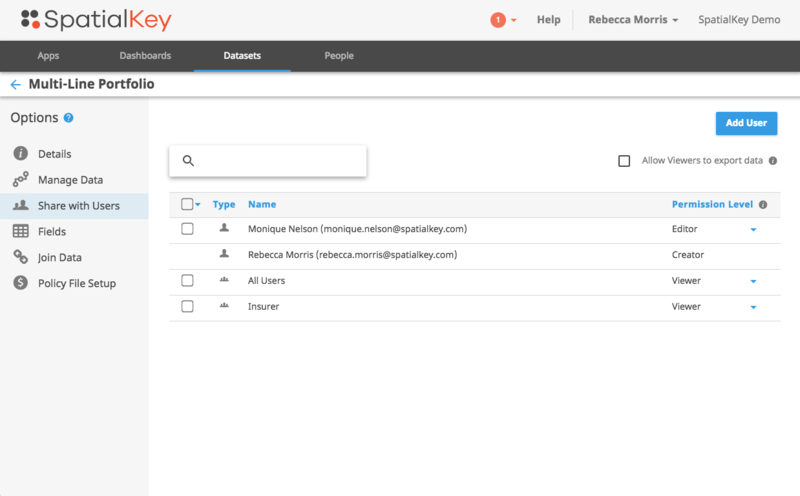 Second, users need access to the dashboard. 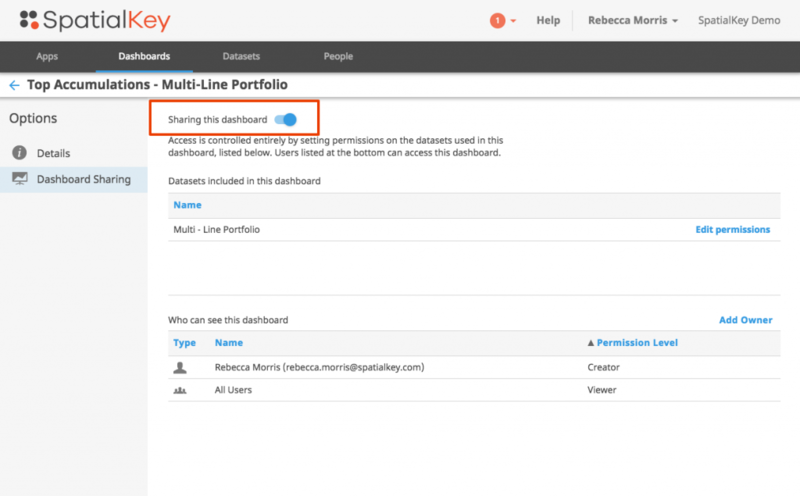 Make sure that your dashboard is “shared with your organization” and if the users have access to the underlying data, they will be able to see the dashboard. You can turn sharing on from within the dashboard itself, or from within the manage dashboard settings. Note: dashboard viewers can view and interact with the dashboard, but they cannot save over the dashboard. Only dashboard owners can save over the dashboard. That’s all there is too it. Just a couple simple steps and you can have a new user set up in your SpatialKey account with access to existing data and dashboards. For more detail, check out this article on Sharing Data and Dashboards.